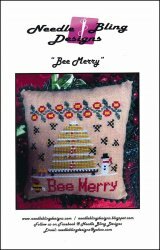 Bee Series: Bee Merry [C5685] - $8.00 : Yarn Tree, Your wholesale source for cross stitch supplies. Cross stitch pattern by Needle Bling Designs. This beehive is all ready for Christmas! Look closely at the beehive & you will see small candy canes stitched. Santa made a special delivery to the beehive, with a Christmas present stitched to the left of the beehive. Look below the beehive & you will see one of the bees wearing a Santa hat. "Bee Merry!" Stitch count 62h x 61w.